Mint state and key date listed Seated Half Dime values is for graded, certified and authenticated coins in PCGS or NGC holders. The rest are a sample of raw coin sell but this is not a guarantee your coin with the same date, mint, grade and holder will sell for this exact value. The Seated Half Dime series has a few key dates worth a nice premium and this series also boast one of the most interesting numismatic stories in history. The most rare Seated Half Dime is the 1870-S with only one specimen known, but according to mint records it should not exist. The lone 1870-S example was found in 1978 in a junk dealer’s box; over one hundred years after it was minted, if it was minted in 1870-S – we can’t know for certain. So there could be another hidden somewhere and yet to be discovered. The 1870-S Seated Half Dime value is currently at 1.75 million so the next one to surface will make the owner an instant millionaire! Here’s a list of the rest of the keys and their starting value: 1838-O (worth at least $100), 1846 (worth at least $300), 1853-O No Arrows (worth at least $150), 1863 (worth at least $150), 1864 (worth at least $350), 1865 (worth at least $300), 1866 (worth at least $340), and there’s a couple other dates that are considered “better” dates. The common date Seated Half Dime value is anywhere from $5 to $15 depending on how much wear and if the coin is damaged or cleaned. The higher the grade the higher the premium and the key dates can get extremely expensive in higher grades, and when I say “higher” grades then I am referring to grades of AU (About Uncirculated) and up. Although a few low mintage dates and mints will be expensive in lower grades, this is the exception and not the rule. As an example a 1846 is worth around $300 in G4 (Good), in AU it’s worth around $6,200, in MS (Mint State) can be worth at least $10,000, and up to $20,000. In comparison, the common date 1856 is worth less than $15 in G4 grade, $115 in AU and $230 in MS. So grading is important and these values only apply to coins that are problem free. The varieties for this series do add a premium but in the lower grades not so much, but once the grade increases then the value differential is much clearer. 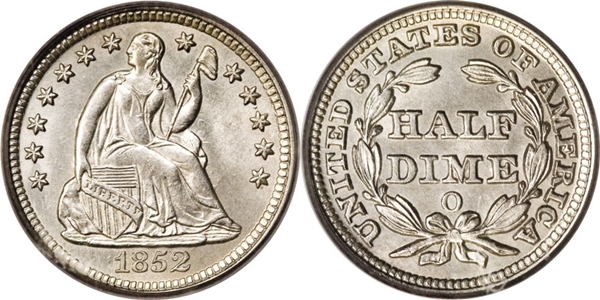 For example the 1840-O With Drapery, Type 3, Stars on Reverse is $25 in G4 and over $3,000 in AU55, but the 1840 with drapery is $15 in G4 and only $300 in AU55 so the mintage of each variety, plus the grade is going to make the difference in Seated Half Dime Value. Mint mark: None for Philadelphia Mint, S for San Francisco Mint, O for New Orleans Mint, and appears below DIME on the reverse. Seated half Dime value by date, mint, grade, condition and variety.